Flying Thopter Squadron comes into play with three +1/+1 counters on it. 1, Remove a +1/+1 counter from Thopter Squadron: Put a 1/1 Thopter artifact creature token with flying into play. Play this ability only any time you could play a sorcery. 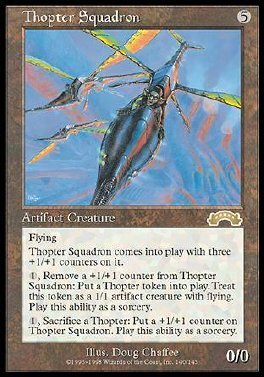 1, Sacrifice a Thopter: Put a +1/+1 counter on Thopter Squadron. Play this ability only any time you could play a sorcery.